This objective remains the same today. 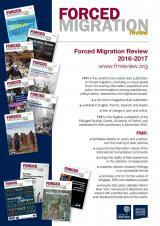 Forced Migration Review (FMR) presents concise, accessible articles in a magazine format. Each issue has a feature theme and, usually, a range of general articles on forced migration. FMR is published in English, French, Spanish and Arabic (and occasionally in additional languages), and is available free of charge in print and online. promote knowledge of, and respect for, legal and quasi-legal instruments relating to refugees, IDPs and stateless people. FMR supports the interests and information needs of those responding to crises that cause displacement; publicises research that is relevant to these interests and needs; and aims to support learning, training, advocacy, policymaking and research. FMR is neutral and impartial, and is committed to the rights and protection of stateless people and forced migrants of all kinds. FMR is read in print and online throughout the research and international humanitarian communities and has a majority Southern readership. Each issue of FMR is distributed in over 160 countries to local and international NGOs; UN agencies; Red Cross/Crescent branches; refugee/IDP camps and refugee associations; donor agencies; research and policy institutes; university and college departments; human rights agencies; foreign, interior, health, welfare and other ministries; libraries; the media; and individual members of the public. We usually publish FMR in four languages: English, Arabic, Spanish and French. Some issues have been printed in additional languages to increase access, and articles from FMR have independently been translated into a variety of other languages. FMR is firmly grounded in a world-class academic institution, and is also deeply rooted in policy and practice. The FMR Editors have many years’ experience working in the international humanitarian community, including in the field. They bring to bear their own experience and their location within academia not only in researching FMR themes and developing outreach networks but also in editing FMR articles to be accurate, useful, succinct, relevant and accessible. As the in-house publication of the Refugee Studies Centre, FMR is a key part of the RSC’s dissemination and outreach activities.